We posted about the new Infraworks to Revit Interoperability Add-in from Autodesk back in April. Details were non-existent at the time. Over on his BIM Chapters blog, Dan Stine posted about his exploration of the add-in. Autodesk has a new add-in listed in the Autodesk Desktop App called Infraworks to Revit. Don't get too excited just yet, unless you design bridges/tunnels in Revit. I am sure this functionality will expand in the future, but right now this add-in just supports bridges and tunnels. If you are not familiar with Infraworks, in a super simplistic sense, it is to Civil 3D what FormIt is to Revit. In reality, Infraworks is much more sophisticated and I have heard that Autodesk is putting more resources into developing this preliminary design tool, than Civil 3D itself (but I have no way of knowing this for sure). 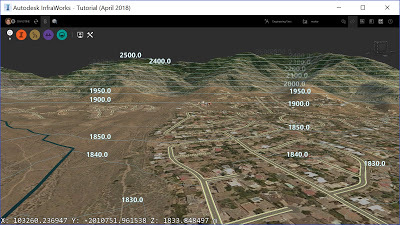 The Infraworks screenshot below shows an area created automatically just by selecting a region; with grade, aerial iamge, existing roads and bridges, and even 3D building where public GIS data is available. New surfaces, roads and bridges can easily be added. Then, the surfaces, roads, bridges can be pushed into Civil 3D for further refinement and documentation. Some Civil 3D elements can also be imported into Infraworks. Using Revit for detailed design of bridges and tunnels in InfraWorks; this Revit add-in allows you... to make changes to a bridge or tunnel in InfraWorks, and push those changes to the existing Revit model for that bridge or tunnel. Autodesk Revit 2019 is required.